Desert Sled inherits the Urban Enduro logo as it is its explicit evolution. 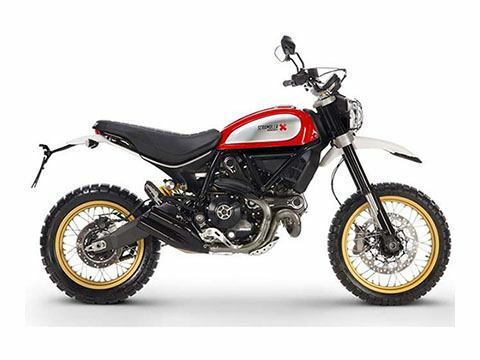 In fact, it is to its strong offroad character that we owe the new riding position characterized by a higher seat, a reinforced frame and fully adjustable suspension, the presence of a type-approved grid on the front headlight, the engine protection, and with the new Pirelli Scorpion™ Rally STR tires with spoked wheels 19-inch front / 17-inch rear. Front - Spoked aluminium wheel 3 x 19 in. Spoked aluminium wheel 4,5 x 17 in. Wet - 207 kg (456 lb) *Kerb weights indicate total bike weight with all operating consumable liquids and a fuel tank filled to 90% of capacity (as per EC standard 93/93).